This is the aspectarian for Sun conjunct Neptune in Aquarius. 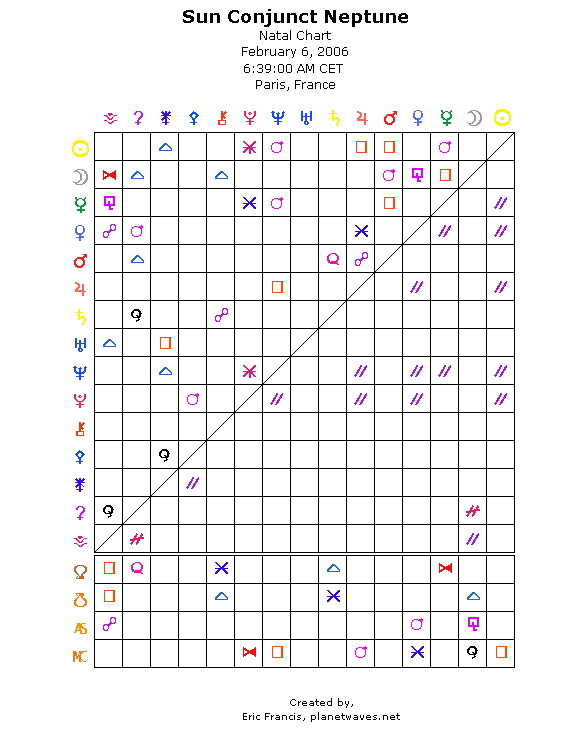 The aspectarian is a square astrology chart that shows the relationships between the planets on a grid. It's easy to use; you look down one column till you see a glyph and then you know that you've got a meeting of some kind between the two planets. The two purple lines are the "parallel" aspect, rarely mentioned on Planet Waves or in popular astrology -- but an important aspect nonetheless. A parallel occurs when the planets are at the same declination, on the same horizontal plane. As you can see, there are quite a few parallels this day, which means that in addition to many precise aspects by longitude (around the circle) there are also many alignments on the horizontal levels as well. This is really an extraordinary number of parallel aspects...15 in all...more weirder yet for coming in the midst of so many other events and cycles occuring at the same time.